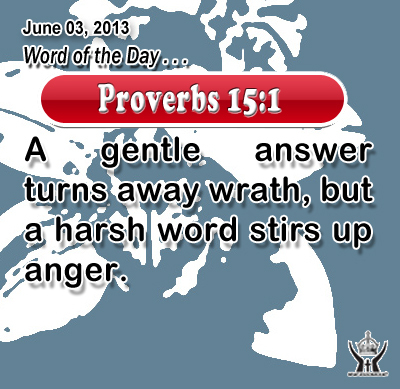 Proverbs 15:1A gentle answer turns away wrath, but a harsh word stirs up anger. Heavenly Father, help us more carefully guard us speech from things you hate, especially gossip, insult, anger and suggestion. Thank you. In Infant Jesus name and by Jesus' grace we pray. Amen. 1And he began to speak to them in parables. "A man planted a vineyard, and set a hedge around it, and dug a pit for the wine press, and built a tower, and let it out to tenants, and went into another country. 2 When the time came, he sent a servant to the tenants, to get from them some of the fruit of the vineyard. 3 And they took him and beat him, and sent him away empty-handed. 4 Again he sent to them another servant, and they wounded him in the head, and treated him shamefully. 5 And he sent another, and him they killed; and so with many others, some they beat and some they killed. 6 He had still one other, a beloved son; finally he sent him to them, saying, `They will respect my son.' 7 But those tenants said to one another, `This is the heir; come, let us kill him, and the inheritance will be ours.' 8 And they took him and killed him, and cast him out of the vineyard. 9 What will the owner of the vineyard do? He will come and destroy the tenants, and give the vineyard to others. 10 Have you not read this scripture: `The very stone which the builders rejected has become the head of the corner; 11 this was the Lord's doing, and it is marvelous in our eyes'?" 12 And they tried to arrest him, but feared the multitude, for they perceived that he had told the parable against them; so they left him and went away. This parable tell us today is richly conveys some important truths about God and the way he deals with his people. First, it tells us of God's kindness and trust. The vineyard is well ready with all what the tenants need. The owner went away and left the vineyard in the hands of the tenants. God, likewise trusts us sufficient to give us freedom to run life as we choose. This parable also tells us of God's endurance and justice. Not once, but many times he forgives the tenants their debts. But while the tenants take benefit of the owner's patience, his judgment and justice prevail in the end. Jesus predicted both his death and his ultimate triumph. He knew he would be discarded and be killed, but he also knew that would not be the end. After refusal would come glory the glory of resurrection and ascension to the right hand of the Father. Thank you, Loving Infant Jesus, for all the benefits which you have given us; for all the pains and insults which you have accepted for us. O most merciful redeemer, friend, and brother, may we know you more visibly, love you more very much, and follow you more, for your own sake.